From the beginning- amazing. Open communication, they delivered more than what they promised. Young love and the thrills made our wedding! They killed it! The energy was fire- perfomance- beyond expectations! Everyone at our wedding was blown away by YLATT! From the moment we got in touch with them, they were friendly, so responsive, and answered all our crazy questions. Everyone (yes, even grandmothers!) were out on the dance floor. Extremely talented bunch! Someone asked if we could have an anniversary party, just so we could party with them all over again. Can't recommend enough! Best wedding band in boston! My husband and I scoured wedding band sites/videos when we first got engaged. Young Love & The Thrills stuck out instantly! We were even able to see them in person at a bar in Somerville which confirmed that we HAD to have them play our wedding. Andy was super responsive, helpful and supportive from the moment we reached out through our wedding day, which everyone knows is an invaluable trait of a vendor during the hectic planning process. I really can't put into words how fun, outgoing and talented YLTT is. They play the BEST songs, dance and interact with everyone. My entire family and all of our friends were blown away - all asking us for their information to book them. They ended our reception with SHOUT and it was the highlight of the night - the lead singer coming out to the dance floor and literally belting the song while jumping, dancing, lying on the ground. My husband and I are music junkies so the band selection was super important to us. We could not have imagined a better band or experience for our reception. YLATT is the best band we could have had for our wedding. They completely blew us away. They were absolutely incredible. Our guests were in awe and received so many compliments on the band. Not only are they talented, they do an amazing job MC'ing. Their performance of our first dance song, Into the Mystic, was beautiful. The entire planning process and communication with the band was super smooth and trouble-free. We went to see a YLATT show in Boston before booking them to make sure they were great. We knew immediately into the first few songs that they were the one. We and our guests agree - BEST WEDDING BAND EVER HANDS DOWN! I highly recommend these guys - extremely talented, professional, and overall awesome people to work with! Thank you for killing it at our wedding! BOOK THIS BAND! My husband and I never heard Young Love and The Thrills until our wedding night. My sister recommended the band since she has heard them play a few years in a row at Deloitte holiday parties. We and our guests were blown away by how amazing they are. Some guests were shocked by some of the vocals they heard, they thought they were recordings initially! Andy was very easy to work with, very funny guy. They played everything we wanted to hear including the hip hop mix I requested. All of our guests were on the dance floor while the band played and we actually regret not booking them for longer! Thank you Young Love and The Thrills! Can I give YLATT more than five stars please? 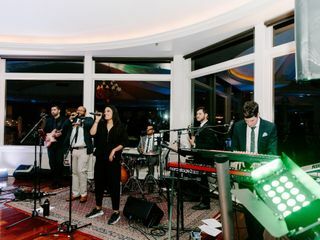 YLATT came highly recommended to me from multiple people that had heard them play at other weddings, and after having them play at our July 2018 wedding, I totally understand why... they are AMAZING! 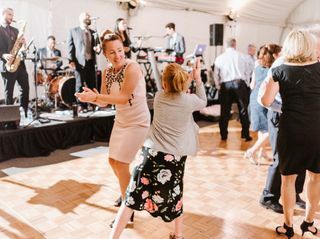 We are still hearing from people months later how much they loved the music, and how much fun they had dancing at the reception. On top of that, Andy made it a breeze throughout the entire process. From the very first conversation, I knew that we were in good hands and could rest easy knowing that the music (arguably the most important part of the reception) would be handled to perfection! I wish I was planning another wedding so I could book YLATT again, and have told anyone and everyone I can how awesome they are. 10/10, highly recommend, you NEED them at your wedding!!! Young Love and the Thrills absolutely KILLED it at our wedding. They played an energized set that kept people on the dance floor and moving until the last song. From our first contact with them through the wedding day, they were incredibly professional and came as advertised. Their manager is responsive and accommodating, and the band is incredibly talented. 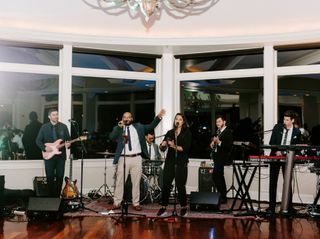 They were energized and fun onstage during our reception, and the cocktail hour music they played was fantastic as well.We received dozens of comments from friends and family about how great our band was, and I would HIGHLY recommend YLATT for any wedding. SIMPLY AMAZING!!! Leading up to the wedding Andy was terrific and very responsive, answered all our questions and calmed all our fears. The day of the wedding they 100% made the night! Friends told me the next day they couldn't leave the dance floor to get a drink because the music was just so good! The set Young Love and The Thrills played over dinner was so beautiful and so many of our guest were complementary. HIGHLY recommend adding the horns, they brought such a cool vibe to the night! The two lead singers, whose voices are ones of angels, were so great coming out on the dance floor later in the night and dancing and singing with our guests and so professional when doing so! Needless to say we had an absolute blast on the dance floor. They ended the night with Shipping Up to Boston which BROUGHT THE HOUSE DOWN!!!! I could not recommend YLATT more. I would pick them over and over again! We had our wedding in June 2018 in Western, MA. Young Love and the Thrills were just the best. Communication with Andy leading up to the wedding was flawless. We were able to discuss customizing the times during which the band would play, both during dinner and during the dancing part, and request specific songs. We had two guitarists play background music during our cocktail hour and during dinner, and then Andy did a great job queuing-up toasts and announcing them during dinner. They followed our timeline to the T. On top of all of that, they were just so damn talented. 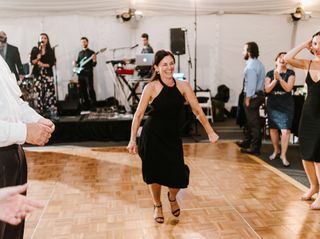 They kept our wedding guests dancing like crazy all night, had incredible energy, and we since have had tons of requests from friends with upcoming weddings. We could not have asked for a better band. Andy and the whole band did an amazing job! Our guests can't stop talking about how great they were. The only mistake we made was not having them there longer! Where do we begin!? First, book this band, they will not disappoint! It is by far the best decision we made. From the moment we contacted Andy a year before our wedding day, to the moment the final guests left, Young Love and The Thrills were professional, accommodating, and so much fun to work with (so much fun, we actually miss planning with them). We chose a less-than-traditional venue at Bayside Bowl--a bowling alley--in Portland, Maine, and Andy was quick to ease all of our concerns. They learned a few songs at our request, and they performed them to perfection. The band was great at reading the crowd; and they transitioned well from ceremony, to cocktail hour, to dinner, to our first bowl. Our guests continue to rave about their performance. Since the wedding, every guest we speak with mentions how great YLTT performed. We have several friends and family members who are planning weddings over the next few years, and we're recommending to all of them that they book Young Love and The Thrills! Young Love & The Thrills did an absolutely incredible job performing at our wedding. By far the most frequent comments we received afterwards were related to how great the band performed. The musicians are amazing (we would strongly recommend a horn(s)), but there are two elements to Andy and the band that we feel really differentiate them from the pack. First, they do a tremendous job at reading and connecting to the crowd. 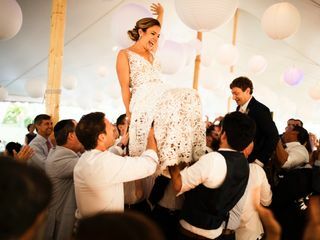 Whether it’s the singer coming out onto the dance floor, understanding when to play what or managing sound levels, they just do a remarkable job at creating an experience that leaves everyone asking “who was that band?” Secondly, and perhaps most important, for those of you planning a wedding, unexpected hiccups will invariably arise as your wedding day approaches. I can tell you first hand that having someone like Andy to walk you through everything and to remain flexible is a HUGE benefit. He made us feel comfortable throughout the process and we made some last minute requests that he was able to fulfill. For those of you in the planning process, I can’t emphasize enough how much of a benefit this is – you want a good communicator and someone that cares as much as you do about your wedding. So ultimately, if you go with Young Love & The Thrills, you’re getting a band that sounds amazing, will ensure your guests have a memorable experience and will help ensure everything goes smoothly. You can’t ask for more from a band on your wedding day. If you haven't booked YLATT yet, GET ON IT. I'm serious, these guys were the best investment we made in the wedding. We live in California, and were unable to see them preform live before our wedding in Maine-- I know this can be nerve wrecking, but I promise you, they will crush it. I cannot even tell you how many guests tell us they were the best wedding band they've ever seen. Some of our guests have even gone to their live shows in Boston since the wedding because they enjoyed them so much. Andy and the team made each step of the process so easy for us, and made the night so much fun -- from the Hora, to the last song, everything was perfect. Pro tip: get.the.horns. You will not be disappointed. We even asked if my younger sister could sing a song with them, and they were totally into it. 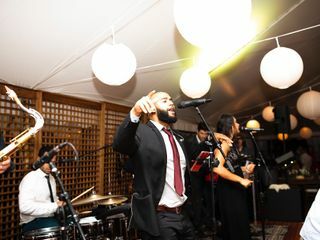 At our wedding, one of our guests came up to us and said, “I didn’t realize John Legend would be singing tonight!” Young Love and the Thrills was the HIGHLIGHT of our wedding! Andy was our point of contact throughout the process: He was professional, accommodating, communicative, accessible, organized, and beyond helpful. The band was lively, talented, energetic, fun. At one point, five members were singing at the same time! Young Love and the Thrills blew all of the other bands we looked like out of the water. Their online media and videos are true to life, and their song list is varied and full of songs for everyone. YLATT does a great job of highlighting your favorite songs and skipping those that aren’t. The band learned TWO songs specifically for us and carefully reviewed the names of the bridal party and our family. We had standing room only on the dance floor all night, and the band did a great job of playing popular songs for the older set and varying with more recent hits as the night went on. The members of YLATT are ridiculously talented, and they played a hugely wide variety of music that appeals to all audiences. All of these reviews are accurate—people came up to us all night and long after the wedding to ask about the band. We’ve already recommended them for two weddings! Young Love and the Thrills was the best decision of our wedding. When we received two unsolicited, raving recommendations for Young Love and the Thrills within a week of each other from some very trustworthy folks, we knew these guys were special and reached out immediately. Andy was incredibly helpful and communicative as we planned our Vermont wedding from across the country. YLATT are a well-oiled wedding machine and floated seamlessly from ceremony music to cocktail hour to reception without any intervention from us. And, of course, they rocked our socks off! They pulled together an amazing set based off our musical tastes that felt personal and had all of our guests on the dance floor all night. We forgot to eat dessert because we were having too much fun. YLATT was a highlight of our wedding. Book them ASAP! cannot recommend YLATT enough. They absolutely made our wedding. Everyone, young and old, was on the dance floor all night, and we are still hearing complements! Andy, our point of contact, was just fantastic. From the time we first engaged the band all the way up until the end of the evening, he was right there with us making sure our needs were met. Our event planner and other vendors really enjoyed working with them too! I must admit, I was a bit skeptical of all the 5-star reviews, but I am here to tell you that each and every star is well-deserved. They are talented, creative, and amazingly easy to work with. 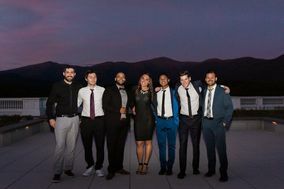 If you are looking for a professional, energetic band with an eclectic repertoire that cares about making your night one to remember, look no further! Book YLATT. You'll be glad you did. Young Love and the Thrills (YLATT) was easily the highlight of our wedding weekend, aside from the actual act of getting married. It was really important to us that we had fabulous music/entertainment, and YLATT did not disappoint. In fact, they totally exceeded our expectations, even after having viewed their awesome video clips online. Every member of the band was extremely talented and they were all great entertainers. Hero, the lead singer, is unbelievable! They all looked like they were having an absolute blast throughout the night. They have the ability to play a variety of styles of music, and they play every style incredibly well. From the Beatles to Pharrell to Sam Cook – they knocked it out of the park. They also did a really nice job of managing the sound level in our reception under a tent. It also cannot go without saying that Andy was an absolutely pleasure to work with throughout the planning process. I had complete confidence in him because of his attention to detail, responsiveness, and his desire to make sure that the band was doing everything they could to accommodate our preferences and make our day truly special. Andy even checked in the day before the wedding, just to let me know that he was available to answer any last-minute questions or concerns. I can’t recommend YLATT enough; again, they truly were the highlight of our wedding weekend! All our guests are still talking about them now, two months post-wedding. We have absolutely NO regrets whatsoever in sharing our big day with YLATT! BEST DECISION OF OUR DAY! We spent hours pouring over wedding bands before booking bc we strongly felt the music makes the night. From the get-go Andy was extremely responsive, insightful and helpful. We added the horns and we highly recommend- they just took the band that extra step that wow'ed every one of our guests. We got married in July and all of our family and friends are still commenting about how fantastic they were. From Despacito to Africa they didnt miss a beat and ALL guests were on the dance floor. IN fact, halfway through the wedding I asked them to stay an extra half an hour bc everyone was having so much fun! At the last minute I mentioned to Andy one of my cousins MAY want to sing "Bust a move" during a break and not only did he play it, but the ENTIRE band got up and backed him up-it was incredible and just further proves their talent. With all the stress and decisions that go along with planning a wedding Andy and his team delivered a flawless performance. I wish we could get married again JUST for them, it felt like a private concert! We already recommended them to another couple getting married at our same venue, jealous of what they have to come! Thanks YLATT for an amazing evening we will never forget. Young Love and the Thrills absolutely made our wedding celebration. Our guests couldn't stop dancing, and then during and after the party couldn't stop talking about how incredible the band was. Multiple people - myself included - felt like they were at a live concert. In addition to just being completely astounding musically, Andy and the band were great to work with, thorough and professional from start to finish. The only downside: all future wedding bands will pale in comparison. Young Love & the Thrills were absolutely a dream to work with. Andy was extremely responsive, and helped us with a crew of friends go hear them at a local bar. Made it so easy and fun. Once we heard No Diggity, we were hooked and booked them. Andy and his team worked with our budget to get us exactly what we needed for our party. They helped us play our particular tracks for the ceremony and dances, and rocked the house after dinner - literally we almost knocked the tent over. Our uncle plays the harmonica, and they let him jam with them as well. My Mother and all of her friends in attendance worked in the music industry for years and have been to countless live shows. Nothing but amazing things to say - they are so talented! Can't say enough about Young Love and the Thrills - they kept our whole party going all night. Let's put it this way - late photos of us that night......very sweaty. Haha! Thank you!!!! Four months later and my guests are still raving about YLTT! These guys were amazing and had us dancing ALL NIGHT. As a wedding planner and bridal boutique owner, I was super disappointed when 3 of my favorite bands to work with were all booked for my wedding date. I ended up hearing about YLTT & went to check then out in Boston - we instantly knew they were going to be a perfect fit for us and booked them right away. It ended up being such a blessing, we were so happy with them! This group of musicians is SO talented and we are so grateful to them for being a part of our wedding. BOOK THEM!! I firmly believe that great music makes a great party. My husband and I are super into music - we live in New York City and go to concerts all the time - so which band to hire was one of the most important decisions of our wedding. When I knew an engagement was around the corner, I started doing some covert research on bands online and poring through YLATT's YouTube account and song library. I was sold and as soon as I showed my husband, so was he. We reached out to the phenomenal Andy Wesby and booked them the second we had decided on a date. We went with a package for ceremony guitar, cocktail duo and 6-piece reception band. Through the entire planning process, Andy was incredibly responsive and helpful in answering all of our questions. On the actual wedding day, they went above and beyond any of our expectations. 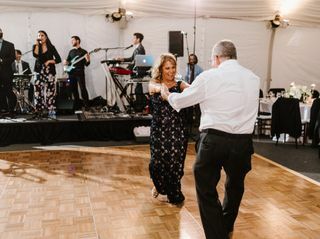 As we'd planned with Andy, YLATT had learned a new song for my father-daughter dance and would stick to a list of our favorite tunes for the reception. But the day before the wedding, we had a major wrench thrown in our plans. My brother and "Man of Honor," on active duty in the Air Force, would not be able to be present at our wedding after all. I refused to accept that he would not be part of our day, so set out with a plan to have his speech streamed to the reception via big-screen TV. Even at the last second (and with normal setup and sound check to contend with), the YLATT team made sure that we could hook up to their sound system so that my brother's voice could fill the tent and he could be part of our day after all. That would have been enough to make us worship them, but they went on to play hours of high-energy, phenomenal music that our friends and families danced to all night and are still raving about 5 months later. Young Love and the Thrills are not only a group of supremely talented musicians, they are genuinely great people with whom we were honored to share our wedding day. We cannot thank or recommend them enough. YLATT was awesome! All of our guests loved them and the dance floor was packed all night. Andy was great to work with leading up to the wedding. Totally stress free and accommodating. They even learned a few songs for us. My husband and I knew we had to have Young Love and the Thrills at our wedding from the very first time we heard them. This young band is so talented and high energy! Andy Wesby was our point of contact and he was easy to communicate with and really worked with us to plan the perfect wedding. They song list the band provided was both diverse and extensive and we were able to add a few new songs to the list. The band even learned an Ed Sheeran and Machel Montano mashup for our first dance! The band members coordinated with venue staff well and were very professional. This band will always hold a special place in our hearts. We were married on April 2, 2017 and still often go to see this band perform locally.